WASHINGTON, DC — The American Hellenic Institute (AHI) celebrated Greek Independence Day at the White House on March 22, 2018. 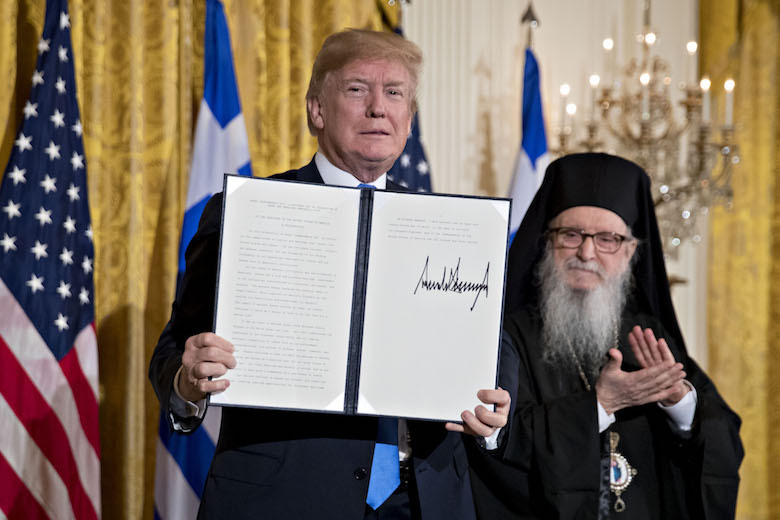 AHI President Nick Larigakis, AHI Board Members Dr. Athina Balta and Demitrios Halakos, AHI Foundation Board Member John Alahouzos, and AHI Legislative Director Peter Milios attended the ceremony officiated by President Donald J. Trump, and His Eminence Archbishop Demetrios, Geron of America. To view President Trump’s remarks, please click here. To view the White House Proclamation, please click here. To watch an excerpt of the president’s remarks, please click here.